Watch Seinfeld Season 2 Episode 6 online via TV Fanatic with over 5 options to watch the Seinfeld S2E6 full episode. Affiliates with free and paid streaming include Amazon, Vudu, YouTube Purchase, Google Play, and Hulu Plus. 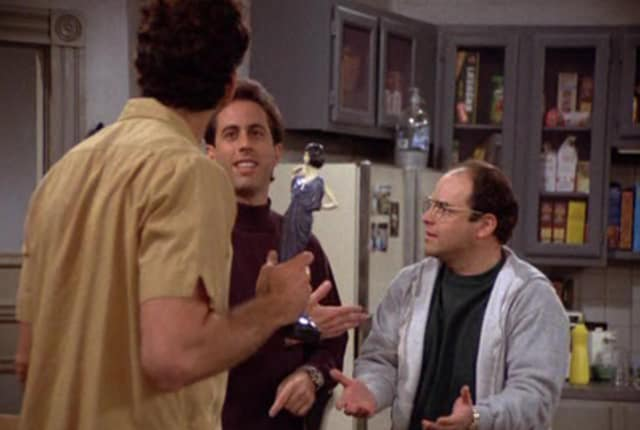 Jerry inherits some of his grandfather's stuff and in the collection is a statue that looks like one that George's family had until he broke it. Jerry promises it to George, but the statue gets stolen. Jerry: (to Rava) So, where's this boyfriend of yours? I can't wait much longer. I've got a flight. Elaine: Oh, probably caught in traffic. Rava: Or maybe he's dead. Jerry: So what do you write, children's books? (to Jerry about Ray) Remember, don't take any crap. Permalink: Remember, don't take any crap.